Finding family friendly things to do in a new city can initially seem very overwhelming and does requires a bit of research. But since moving to Sydney, there are a number of fantastic websites, blogs and resources that I'm constantly looking to for inspiration and information. I've compiled a comprehensive list below and while many of these cater to families with kids of all ages, they have been a great starting point to find toddler friendly activities and outings. We're based on Sydney's Upper North Shore so if you're also on the northern side of the harbour, all the information you need is in this handy directory! ellaslist started out in 2010 when one mum decided to create a family friendly local guide for parents, based on things to do with her daughter. It's now grown into a huge online resource of everything that is happening for families in both Sydney and Melbourne. It's so comprehensive and jam pack with information. Hello Sydney Kids is another resource that has been created by an inspiring mum who has meticulously detailed her families adventures across Sydney. It's full of great articles on beaches and playgrounds and things to do in Sydney and surrounding areas. Busy City Kids is my go to place to find out about current kid friendly museum and art gallery exhibits. It's also created and curated by mums and has reviews and guides for attractions and activities in Sydney and Melbourne. Adventure, Baby is a blog by travel writer Christine Knight. While she has travelled extensively around the world and shares lots of stories, guides and international travel tips, she's based in Sydney and always has a great articles on things to do in her home town with her daughter. The following are websites and social media accounts that focus on a specific area of Sydney. Created by local parents, they are handy resources for finding out whats on closer to home. These are the ones I refer to regularly - they are a great way to discover new playgrounds and kids friendly cafes! Another great, free resource is Child Magazines - you can pick them up monthly at libraries, shopping centre and cafes; they have some informative articles and a list of what's on for kids that month. Plus the website has even more parenting related content - check out their mini mags! All the websites listed above have the option to subscribe to their newsletters which is a great way to received ideas and inspo directly to your inbox! I've also signed up to the newsletters for many of the museums and art galleries around Sydney, to stay up to date with upcoming exhibits and activities. Asking other local parents what they got up to on the weekend is an obvious way to get new ideas and recommendations. It's a great conversation starter and you'll get an honest review of things. It's my go to question for small talk at playgroup and playgrounds. I hope this list inspires other parents to find new adventures for your little ones and create some wonderful family memories. If you're not a Sydney local, it only takes a bit of web searching to hunt down similar online resources for your own home town. Have I missed anything? I'd love to hear your tips and suggestions! Feel free to leave your comments below. 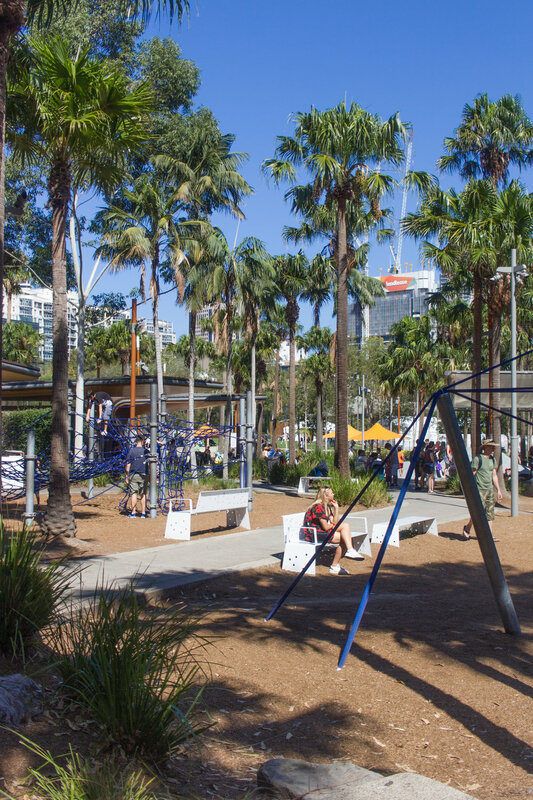 The Children’s Playground at Darling Quarter is an inner city oasis, full of state-of-the-art play equipment that will keep kids entertained and active for hours. And best of all, it’s absolutely free! There is everything from climbing webs, big slides, flying foxes, jumbo swings and sand pits. But we went along on a hot Saturday to take advantage of the amazing water play area. 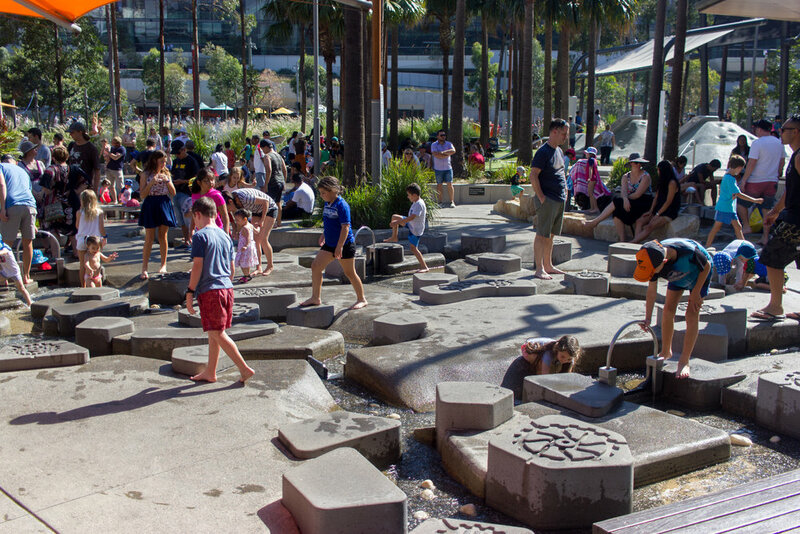 The splash area includes water pumps, water wheels, a water screwdriver, water spouts and a maze of shallow waterways between rocks, complete with little dam walls that kids can lift up or down to change the course of the water. It’s so fascinating to watch kids play together and explore the water courses. Farley loved just following all the little canals and climbing over the concrete blocks. There is also another really new, large, very shallow pool (like ankle depth), perfect for little ones to splash in. We dressed Farley in her swimsuit mainly for sun protection but also because a toddler will no doubt sit in the shallow water. Older kids could still enjoy the water play area without getting fully drenched. If you have a baby and a toddler, I recommended visiting with two adults; we took it in turns to closely follow Farley around the water and while the other sat with Hallie in the pram off to the side. 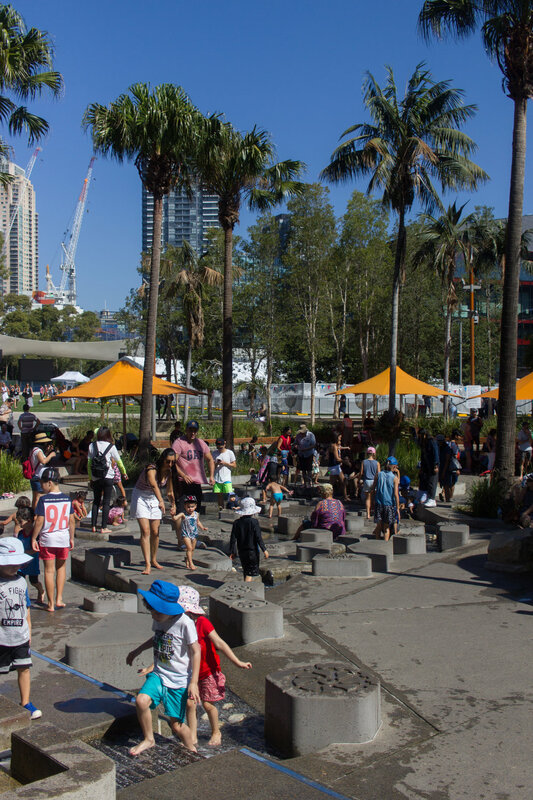 Getting there: The Darling Quarter Children’s Playground is located right in the middle of Tumbalong Park in Darling Harbour. The closest car park is the Wilson car park on Harbour Street but there are many other city car parks within a short walk. The closest train station is Town Hall which is a 9 minute walk and the closet ferry stop is Pyrmont Bay which is a 15 minute walk. Sun protection: There are a few shady areas within the park but the water play area is in full sun so full sun protection for little ones is highly recommended. Pram friendly: It was very crowded on this particularly hot weekend so navigating around with a pram was a tad difficult but overall achievable. . 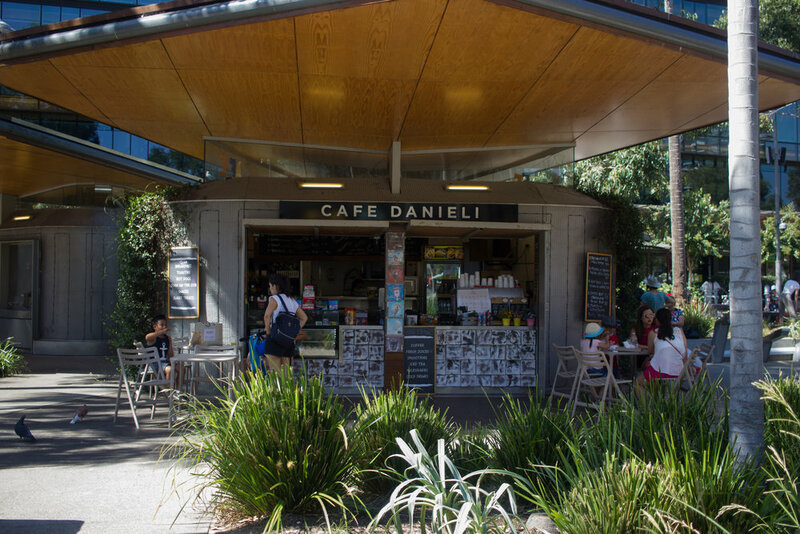 Dining: There is a small kiosk, Cafe Danieli, within the park area but the whole area of Tumbalong Park is surrounded by such a wide variety of restaurants and plenty of grassed open spaces for picnics. Luna Park is Sydney’s iconic amusement park that sits on the edge of the harbour, right under the northern side of the Sydney Harbour Bridge. The giant face has been recognisable since it was first built in 1935 and has withstood some tumultuous reincarnations over the years (think deaths, fires and demolition, oh my! the history of Luna Park is quite fascinating). 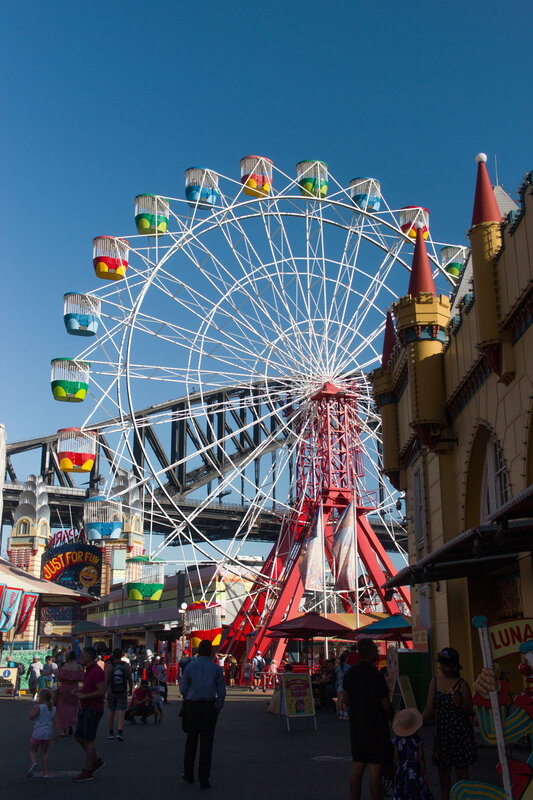 Despite that, Luna Park has been a place for carnival stye family fun for many years and it’s been on my list of places to visit since we move to Sydney. But my big question was; is it toddler and baby friendly? 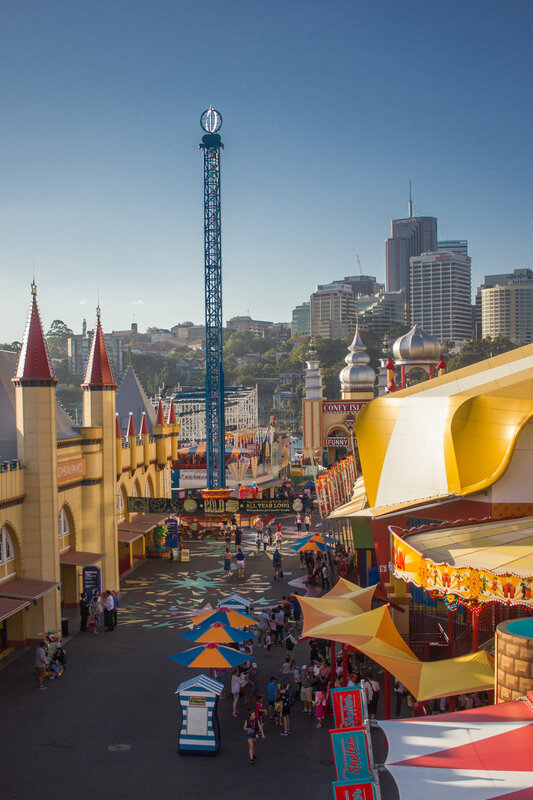 First and foremost, the best thing to know about Luna Park Sydney is it’s free to enter, you just pay for the rides you go on. The atmosphere of Luna Park just screams families fun; it's that old time fair ground feel - the lights, the colours, the music, the sounds of the rides. 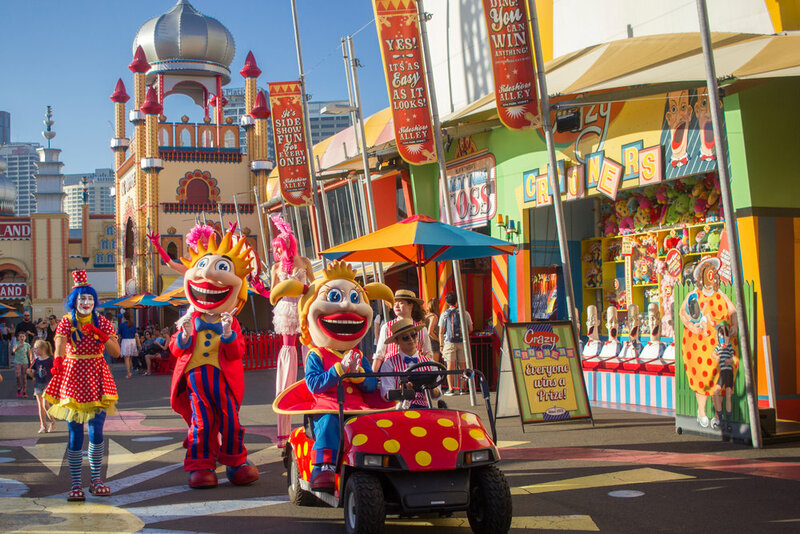 It’s a total sensory overload for a little one, so visiting Luna Park will definitely excite, even if you just go in and enjoy an ice-cream. As for the rides, while there is so many to choose from for kids and adults, the only two that a little two year old can go on is the carousel and the ferris wheel. We purchased 1 Unlimited Rides Pass - Red for $22 which allows a guest from 85-105cm unlimited amounts of rides all day. Technically Farley could ride with us accompanied for free so Braino went on the carousel with her and I went on the ferris wheel with her. (We were a bit sneaky and just use the one wristband between the two of us) We could have purchased individual tickets for both the rides for $10 each but Braino opted to get the unlimited pass just incase we wanted to do a ride twice. Farley absolutely loved the carousel! As soon as she saw it, she was so excited about the ponies and just wanted to go for a ride. However, she was too little to sit on one of the ponies but could sit in the sleigh. But she still had the biggest grin on her face. I was keen to take her on the ferris wheel, and to also take photos of the spectatular view from the top. I was half expecting her to get a bit frightened, but it was actually me who had a little anxiety about being so high in the air, especially when it came to a stop at the top. Farley just peered over the edge, down at the rides below, like it was the most natural thing ever. Once we were back on solid ground, she enjoyed watching the street performers but was not too keen to do the classic clown mouth game. (But who could blame her, those things are a little creepy). Hallie enjoyed cruising around in the pram and having a feed while we watched the street performers. We took it in turns to go on a ride with Farley so one of us could wait with Hallie, but we probably could have taken her on the ferris wheel, wearing her in the ergo carrier which we also had with us. I did see people leaving prams at the base of the ferris wheel. So our verdict is; Luna Park Sydney is definitely worth a visit with a toddler. You don’t need a lot of time, an hour or so is plenty to enjoy the fair ground atmosphere. 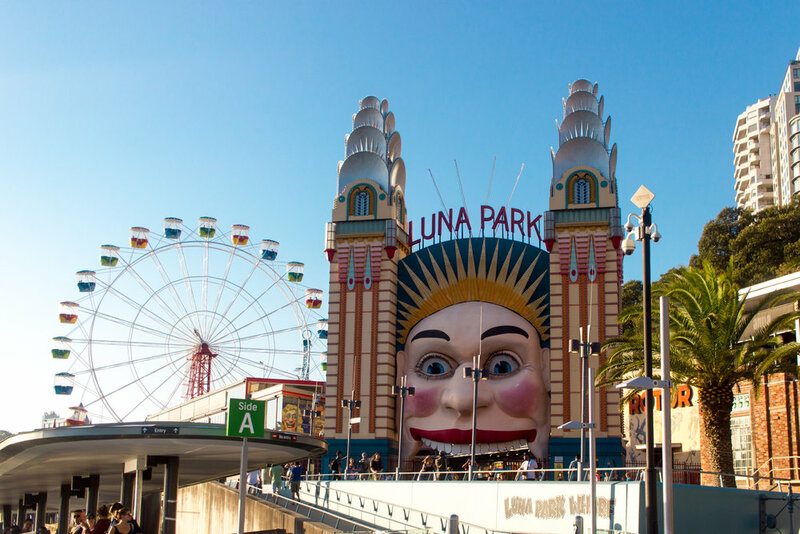 Combining a visit to Luna Park with a ferry ride is a great way to fill out an afternoon on Sydney Harbour. My tip would be - bring the grandparents along so they can stay with your little ones while you enjoy more of the adult rides! Getting there: The Milson's Point ferry terminal is within meters of the front entrance, a bus stop is only a short distance away and the Milsons Point train station is only a 10 minute walk away. Although it is uphill from Luna Park to the train station. If you do want to drive, Luna Park has it's own car park. The most you will pay is $39 for any visit over four hours. More information can be found on Luna Park's website. Pram friendly? : Yes, we didn't encounter any stairs and it wasn't very crowded. 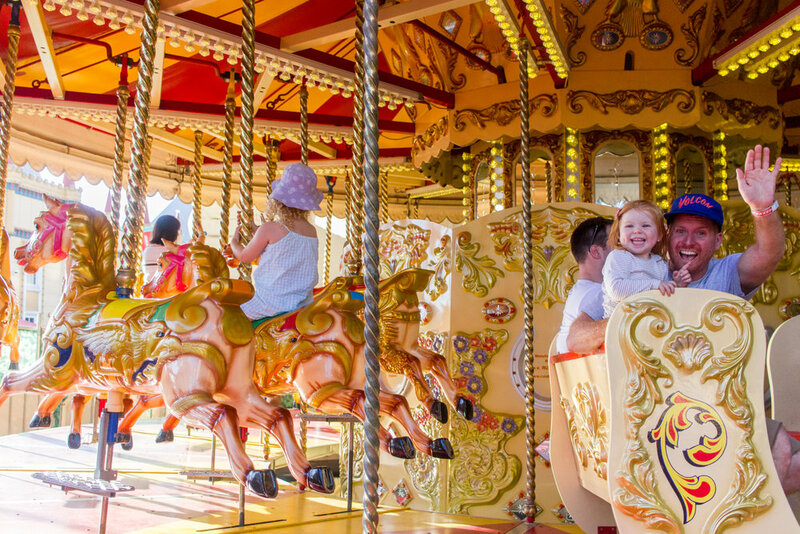 I would recommend that if you have a baby and a toddler - its definitely a two adult outing, however, if its just you, your toddler and your pram, it seemed pretty safe to leave your pram off to the side while on the ferris wheel and carousel. Toilets & baby change facilities: There are plenty of public toilets but it was pretty lacking in parents rooms - from what we could find. Plenty more information is available at Luna Park Sydney's website. 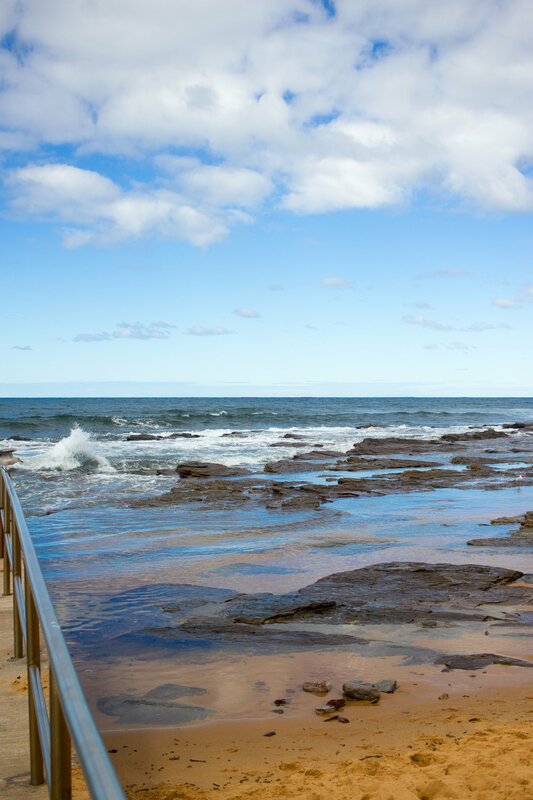 It may seem like every time we go to the beach, I declare 'we've discovered our new favourite' but that’s because when it comes to the the northern beaches of Sydney, we truly are spoilt for choice. 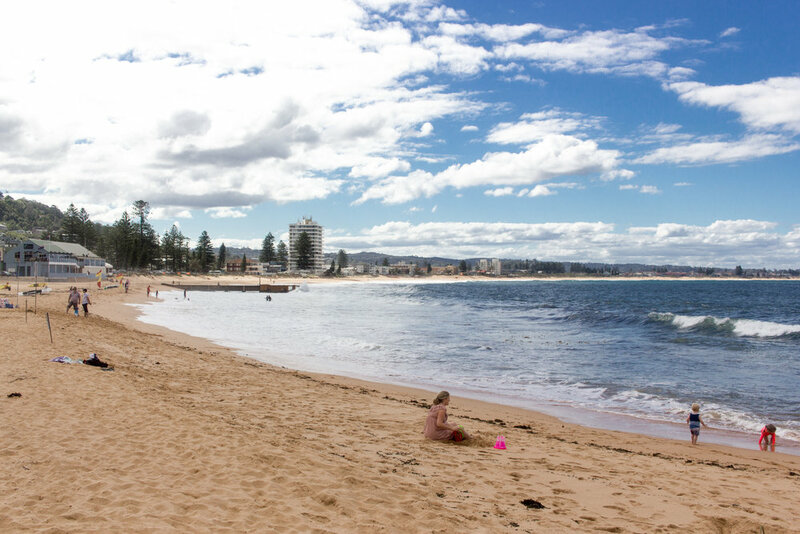 This weekend we headed to Collaroy Beach and discovered yet another great family friendly location. Our late afternoon at Collaroy Beach was mainly to have an early dinner of fish and chips by the ocean and have a play in the playground. We weren’t planning on swimming as the weather that morning had been a little overcast however, it was a speculator afternoon with blue skies and delightfully warm autumn sunshine. 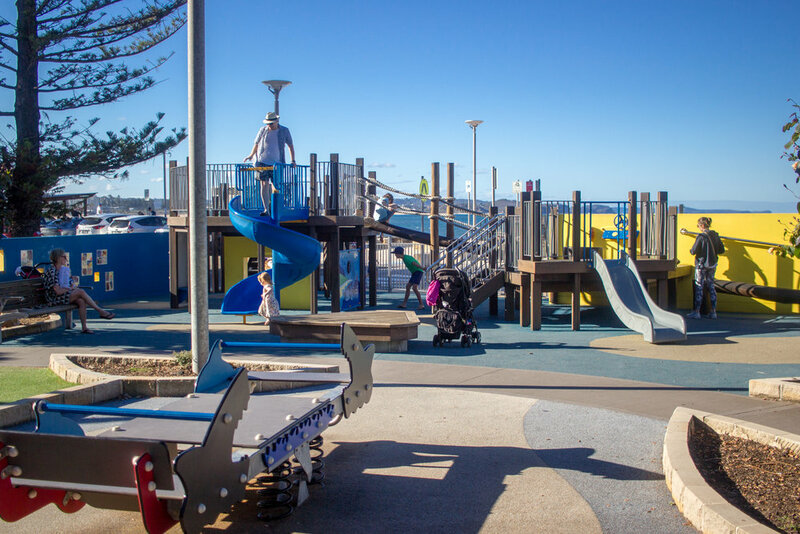 Collaroy is similar to Dee Why Beach in that it’s a surf beach with two choices of ocean pools; one being especially designed for young children, and a fantastic playground at the southern end of the beach, along the promenade. However, Collaroy is much quieter, lacking the busy restaurant and cafe scene of Dee Why, but that almost makes it even more appealing for young families. The playground is fully fenced and includes a climbing fort, swings, big rope climbing web, see-saws and a merry-go-around thing that every kids wants to go on but gives all the parents heart palpitations. 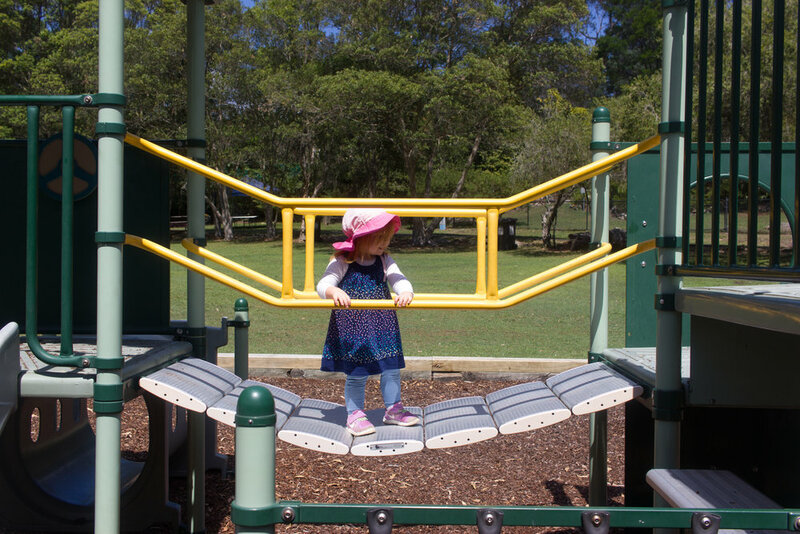 It’s a great playground for all ages but there is plenty to keep a little toddler occupied as well. The ocean pools are wonderful; only a short stroll from the playground and car park, making it very easy assessable for prams. There are also concrete steps beneath the rock wall which provide plenty of seating. If you venture beyond the ocean pools, around the headland, you’ll find another smaller beach with some beautiful tidal rocks pools, perfect for little ones to wade in and explore. We could see ourselves spending a lot of time at these rock pools when we return for a swim. Getting There & Parking: Getting to the northern beaches via public transport is rather tricky as there isn't a train line that services the area. The B1 bus will take you from Sydney city to Collaroy or check out the Transport NSW website to plan your trip from another location in Sydney. Driving is the most convenient way and there is a small carpark right next to the beach, between the playground and surf life saving builiding. Parking is 'pay and display'. Pram Friendly: We didn't have the pram with us but it would be very easy to puch one down to the ocean pools, along the footpath and there is plenty of space within the playground. Sun Protection: There are shade cloths over sections of the playground however hats and suncream is highly recommended for the beach. Dining: There are a few cafes across the street on Pittwater Road like Stay Grounded and The Beach Club is a short walk down the beach front, We loved the fish and chips from The Reef Food Bar but it was a 2 minute drive away. Learn & Play! 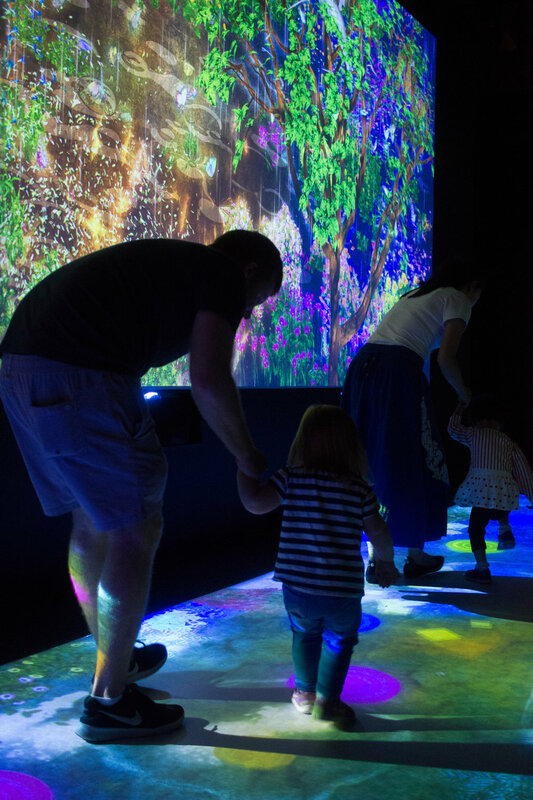 teamlab Future Park at the Powerhouse Museum is an amazing, innovative exhibition for the whole family. Described as a digital playground, Future Park combines light, art and technology in an incredibly interactive way. The Powerhouse Museum has been a weekend favourite of ours since moving to Sydney; there is always so much there to entertain a toddler (The Wiggle Exhibit being the main drawcard). This was actually the second time we visited Future Park, the first time Farley and I came with my friend and her little 18 month old. This time we had our husbands along for a combined family day out. (And Hallie of course - although technically she was with us the first time). I'm not sure who had more fun, the toddlers or the dads! Farley loves colouring so naturally she was captivated by the exhibits were you can colour in an image with crayons, scan it and the image then appears on one of the large screens, animated and interacting with all the other scanned characters. The Sketch People sections allows you to bring a person to life, which is similar to the Sketch Town section where you can create cars, trucks, and rockets. The Graffiti Nature area is an amazing section where you can bring a variety of creatures to life and watch them crawl around a big pit like sapce that you can climb up and slide down. 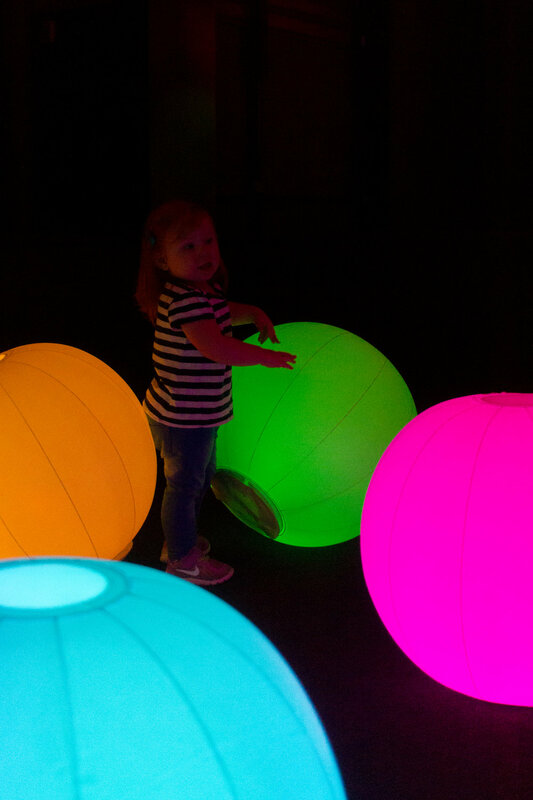 The Light Ball Orchestra, where huge illuminated balls change colour when you touch them, was a huge hit with everyone. There was a smaller ball section, ideal for little ones, as the bigger area does get pretty hectic with enthusiastic older kids. The Hopscotch for Geniuses and the Connecting: Block Town sections were also wonderful for our inquisitive toddlers. All the bright moving images that react to your touch had our little ones mesmerised. It's kind of mindblowing to think that while this sort of technology is amazing to us as parents, it will be pretty primative compared to the kind of technology our kids are going to grow up using. Learn and Play! teamlab Future Park is one of the best museum exhibition I've been to! It's not often that together; children and adults can create, interact and immerse themselves in such a sensory way. It is, however, quite difficult to photograph, in order to really do it justice. Hopefully my photos below give you a good idea. Cost: Adults - $28, Concessions - $22, Child(4 - 16 years) $17.50, Child (Under 4 - Free) The Future Park tickets also include asscess to the rest of the Powerhouse Museum. It is recommended to book tickets in advance during weekends and school holidays. Pram Friendly? : The Powerhouse Museum is very pram friendly however prams are not permitted in the Future Park exhibition. Prams are required to be checked in at the cloak room outside the entrance. Bring a carrier for smaller bubs. Feeling a little guilty about the amount of television Farley has been watching lately and also keen to fill another Saturday that Braino had to work, I decided to get out into nature and explore a park or garden. The Ku-Ring-Gai Wildflower Garden has been on my to-do list for quite some time and, it turns out, it’s perfect for some free range toddler nature exploration! The best part of the outing was the huge goanna we met - for our lizard obsessed toddler, this may have been the highlight of her life to date! Anyway, back to the Wildflower Gardens; I arrived with a picnic packed and Hallie sleeping snuggly in the Ergo Carrier, and was planning to do the Senses Track, however after ducking into the visitor centre and speaking to the delightful staff member, we were off in the direction of Lambert’s Clearing, which has a playground thats ideal for toddlers! We walked to Lambert’s Clearing Picnic Area via the bitumen Solander Track, only 200m from where we parked, and saw the huge goanna lazily walking around the picnic area. At first I thought Farley might get scarred but she was in awe of it and proceeded to follow the goanna around, at a safe distance, waving and squealing Hello Lizard! The goanna was not fazed at all and hung around for a while, doing a few laps of the picnic area, before eventually slinky off into the bush. Of course Farley was curious to know where the lizard had gone so I convinced her to help me look for it in The Fern House and The Knoll; two fenced garden areas next to Lambert’s Clearing. She had fun wandering the paths and climbing over rocks but eventually realised the lizard was long gone and starting saying Farley go home now. So we ventured back to the car on an alternative route, via the Banks Track; along a dirt track, over rocks and along a boardwalk. It was only 200m and Farley was a little champion walking it all, but all the while she was saying Farley go home now. Farley watch a mooo-vie. I now know how my Dad must have felt when he’d take my siblings and I on bush walks most weekends of our childhood. 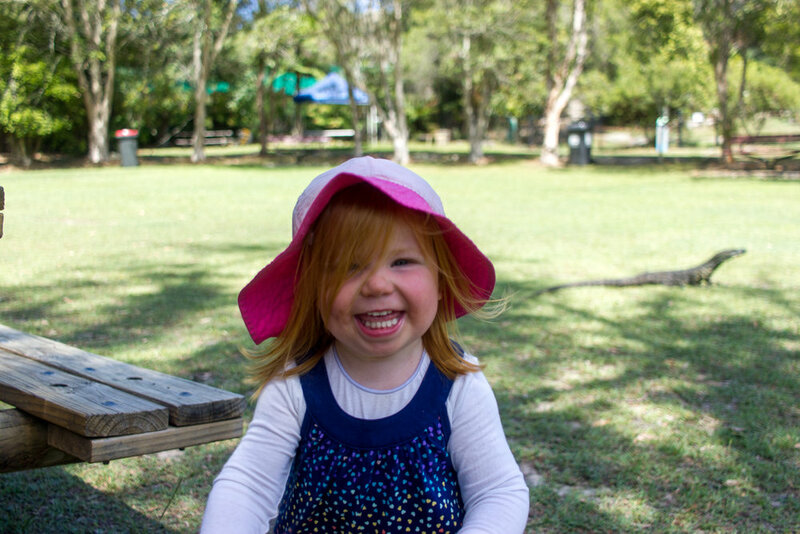 The Ku-Ring-Gai Wild Flower Garden offers so many toddler friendly ways to explore nature. Lambert’s Clearing has the playground, toilets and plenty of shaded picnic areas and with The Fern House and The Knoll right next to the clearing, you can enjoy a picnic lunch and explore so much in one area (there is a shallow unfenced pond in The Fern House and some of the rock steps in The Knoll are quite steep so full supervision is advised). There are a variety of short accessible walks you can do with a toddler and even a pram or bike, with a tracks like the Senses Track, the Solander Trail and The Brown Track being step free. And best of all, it’s free! No entry fee or parking fees. Head to the website for information on scheduled events and activities - I’m keen to take Farley to one of the Toddlers and Tadpoles weekly playgroups. Dining: Best option is bring a packed picnic lunch or use one of the BBQs for a sausage sizzle. you can buy refreshments like drinks and ice blocks at the Visitor Centre. Built in 1819, Sydney’s Hyde Park Barracks is a UNESCO world heritage site, preserving a significant piece of Australian history. The barracks were originally built to house convicts; but later went on to serve as an immigration depot and asylum for women and was then used for various courts and government buildings. Today, the museum provides a tangible connection to the history of the city; the interactive displays and exhibits will educated and entertain the whole family. I have a bit of a fascination with historical buildings and am slowing ticking of all the Sydney Living Museum locations. We ventured into the city for bit of shopping and were able to spend an hour or so exploring the Hyde Park Barracks. While it's set up perfectly for school aged children to explore and learn, it's still worth a look with an inquisitive toddler. Older children would enjoy the audio tour and scavenger hunt style 'Rat Trail' booklet - Farley liked spotting the numbered rats hidden throughout the museum and scribbling on the booklet. The opportunity to lay in one of the hammock or try on a pair of shackles is irresistible to anyone, regardless of age. We were happy to let Farley have a wander around, there wasn't too much for toddler to damage or injury themselves on; it wasn't very crowded and she wasn't too disruptive for other guests. 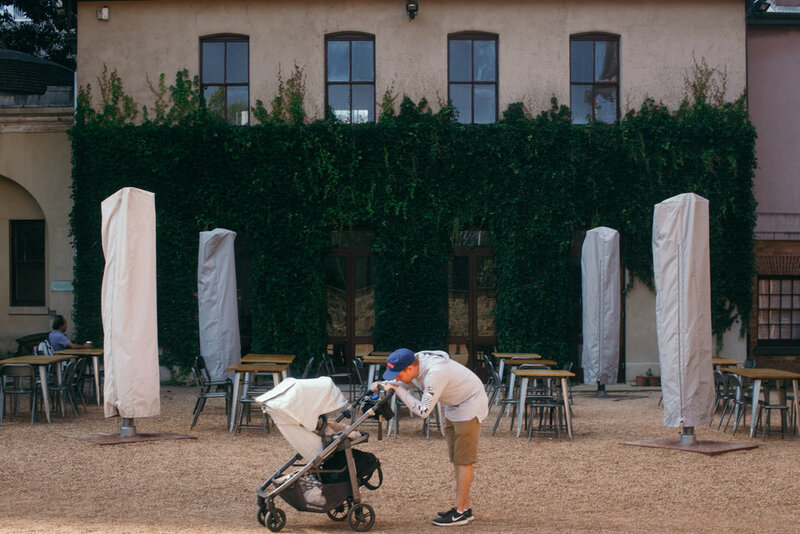 Outside, the Bakehouse cafe is the perfect space to enjoy a quick bite to eat, with enough room for littles ones to explore the outdoor courtyard. There was so much to read and see, I feel I only caught a glimpse - our visit coincided with a bit of fussiness from Hallie so I was slightly distracted for part of it. Never the less, I would highly recommended the Hyde Park Barracks to families visiting from overseas or interstate, or even Sydney based families looking for a hands on way to explore Australian history. Getting there: The Hyde Park Barracks are located in the heart of Sydney city, with no onsite parking. Public transport or one of the city car parks would be your best bet. More information can be found by clicking through to the Sydney Living Museums website. Pram Friendly? The museum is three levels with the top two level only accessible by stairs. We were able to leave our pram in the foyer behind the desk and Farley was happy to walk around. (Hallie was in the baby sling). So much for information can be found on the Sydney Living Museums website. Since November I’ve seen the Pipilotti Rist: Sip My Ocean exhibit at the Museum of Contemporary Art pop up on my Instagram feed a number of times and I've been meaning to go. Things got pretty crazy over the festive season and then with Hallie's arrival, but with only two weeks until the exhibition closes, I was having serious FOMO. However, this weekend, it appeared that most of Sydney also had a fear of missing out, due to the size of the crowds. Pipilotti Rist is a prolific artist in the area of experimental video and multi-media installations. Sip My Ocean showcases key pieces from her career; it’s immersive, interactive and a full sensory experience, which makes it very engaging for kids. I had read a few review on the blogs I regularly follow about it being a real hit with young ones and I wondered if it would be good for a toddler too. Sundays are the best day to go as there is Sundays with Pipilotti, a free interactive creative space where children can experiment with techniques inspired by Rist. On arrival we first headed to the Sundays with Pipilotti area first and let Farley explore. There were small tables set up with different cut out images and mirrors that you could use to photograph your own reflected montage inspired by Rist’s work. In an adjoining room, there were projectors set up with transparent images, leaves, feathers and cellophane to project your own kaleidoscopic creation on to the wall. Farley loved this, we spent quite some time helping her create different artworks. It was fascinating to watch her make the connection between what was on the projector and what was on the wall. I was in two minds about actually going into the exhibit, due to the size of the crowds but I decided I’d be annoyed at myself if we came all this way and didn’t see it. However, would I recommend it for a toddler? Probably not. 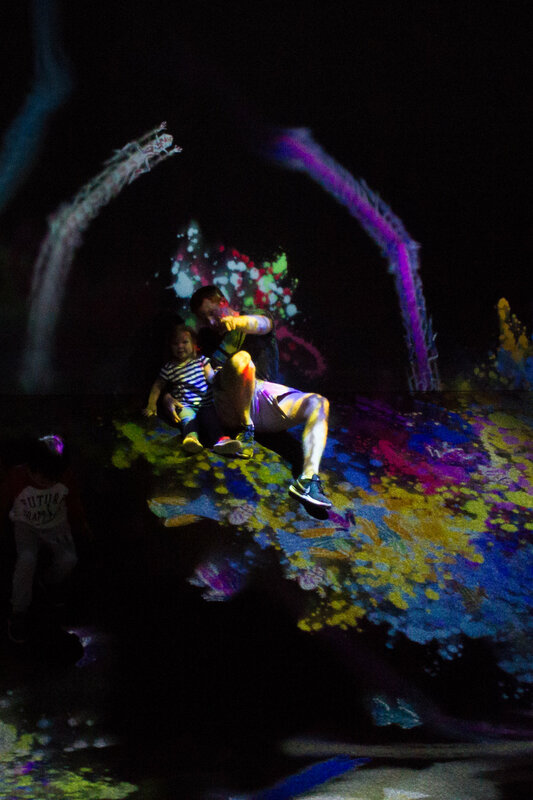 While Farley seems to be having a great time, intrigued and excited by all the colourful projections and sounds, there were a few easy to touch (and potentially break) elements to the artworks. For example the suspended balls in the Sleeping Pollen section and the suspended sheer drapes in the Administrating Eternity section. We didn’t even make it into the Pixel Forest Mutterplatte section, which is a room full of 3000 suspended LED lights, due to the ridiculously long queue. The 4th Floor to Mildness section which was a room full of beds with a video projection on the ceiling was so full, every bed had someone lying on it and most of the floor had people laying down too! It was pretty bizarre. When we entered Braino was like ‘ what on earth....?!?! And Farley was commentating quite loudly all the things she could see on the projection. 'Butterfly!' 'Stingray', 'Where's butterfly gone?' It was cute, but probably a tad annoying to those around us. Having studied Film and Television Production at university, I was really keen to see the work of someone who has pioneered experimental video art; however Sip My Ocean left me feeling curious, if not a little confused. I'll admit, I don't do well in crowds and was probably a little distracted with having the little ones in tow. It's an amazing exhibit but one that you'd want to take the time to fully immerse yourself in. It did get me thinking about what constitutes video art and how it compares to the use of traditional and more technical filmic languages. Braino's thoughts: "That was probably the weirdest thing you've convinced me to go to." I love the fact that the Museum of Contemporary Art provides a free space for children to explore, learn and experiment with art. It made for a great Sunday afternoon family adventure; it's wonderful being able to share my interested with my kids, even at this young age. Oh, I should probably mention Hallie, she was indeed with us. I had her in baby sling the whole time, she was asleep for most of it, only needing one feed and waited until we were about to leave to wake up. Starting the appreciation of art at a very young age! The Exhibit: Pipilotti Rist: Sip My Ocean is on until the 18th of February 2018 - one more weekend to go. The Sundays with Pipilotti creative space will also be running on Saturday the 17th as well as Sunday the 18th. Getting there: The Museum of Contemporary Art is located right on Circular Quay, making it very assessable by public transport. We drove in and parked at the Sydney Opera House, which has a flat weekend rate of $15. Pram friendly? : Bringing a pram would possible although a little inconvenient. We had Hallie in the baby sling and Farley as started to become really good at walking longer distances. She walked all the way from the Opera House. We had all the baby gear in a backpack which we did have to check into the cloakroom. Parents Room: We found the parents room on the ground floor was nothing flashy but totally fine for nappy changes and breastfeeding. Dining: There are a few options for food with in the MCA; the MCA Cafe on the rooftop and GRAZE on the ground level. More info here.